Belinda played and sang in a progressive rock band during the late 1960s and early 1970s, and has been teaching music for many years since then. Her first folk camp in 2000 revived her interest in playing live music. 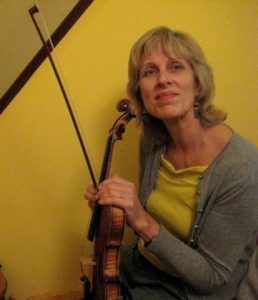 She has developed an interest in French, Swedish and English music and now plays fiddle, melodeon and whistle in SE3, a band whose material includes traditional and self-penned compositions. She feels that folk camps provide a liberating atmosphere in which people can find their own individuality within the context of ensemble playing, singing and dancing. Her workshops focus on harmonies and rhythmic arrangements in preparation for playing for dancing. Here is where Belinda will be a member of staff this season. Follow the link to find out more.